Modern science has not caught up with the phenomena of EFT yet. There is an increasing but as yet incomplete body of research. I can teach you the art and craft of skilful EFT but I can’t teach you how it works. Here though, is my understanding and explanation from the basics of traditional chinese medicine and many years of reading and observation. EFT helps mind and body by combining the elements of western talk therapy and eastern energy medicine. We use simple questions to focus our words on an aspect of a problem: at the same time we tap gently with our finger tips on acupressure points on the face and body. We test as we go. The tapping is very simple: the skill lies in the questions and the testing. Eastern medicine focuses on the flow of subtle electro-magnetic energy known as Qi, Chi, Ki or Pranna. This energy can be measured and flows throughout the body along pathways of lower electrical resistivity in the fascia and connective tissue. These pathways are like your energy motorway (or interstate) system only they all connect: one ends and the next begins. You can imagine big roundabouts at these energy motorway junctions. When Qi is flowing smoothly around your energy motorways you feel calm, think clearly and get stuff done. Acupuncturists say: Flow = No Pain, Pain = No Flow. This applies equally to emotional pain as it does to physical pain. When there is stagnation or turbulence we feel distress or agitation, we can’t think straight and we can behave irrationally. Indeed emotions are our conscious experience of different disturbances in this flow. A snarl up in one part of your energy traffic system may be experienced as anger, a different stuck pattern as fear. We all know that there are countless ways that traffic can get snarled up and that it can be continually changing. Turbulent or stuck energy can be experienced as strong emotions; irrational or unwanted behaviours; physical pain or sensations; or as loaded thoughts. EFT uses words to tune in to stuck patterns and tapping to loosen. The points were we tap are the junctions of the energy motorways. If we get the junctions flowing we get the system flowing. We talk about an aspect of the problem as we do the tapping routine, then we notice what is different. EFT is most effective at the level of sensory detail. Getting there is where the skill lies. The best way to get started is to find someone who knows how to tap skillfully. 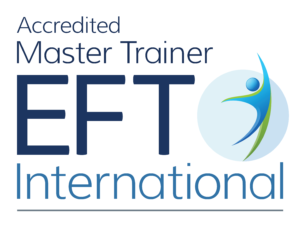 An EFT practitioner is like a personal trainer. You can go to the gym on your own and you do so much more with a trainer. EFT is something you get through an experience rather than an explanation. On our Getting Started with EFT page you will find simple step by step instructions to try it out. Where to tap and what to say.